Can it really already be three years since Messer Hill’s untimely passing – occurring during his treasured Monterey Historics weekend, which reputedly he was a Concurs de Elegance Judge for 40-years! As the transplanted Floridian continued his passion for vintage automobiles after he’d hung up his driving helmet, forming the vintage automotive restoring house of Hill & Vaughn. Interestingly, Ferrari ran four “Works” chassis that day, with Hill, Von Trips, Richie Ginther and Ricardo Rodriguez; while a fifth Ferrari was chauffeured by Giancarlo Baghetti. And not only did Von Trips start the race on Pole, but the German too held a 5-point advantage in the Drivers title fight: 38-33 vs. arch rival Hill; with Lotus’s Stirling Moss having a mathematical, albeit slim chance of clinching the Drivers crown over the two Ferrarista’s. And speaking of those magnificent GT 40’s, how many people recall that Messer Hill was part of ‘Ol Shel’s (Carroll Shelby) original crew ‘O merry-men chosen to drive the untested chassis at Circuit de la Sarthe in 1964, as I’d liken to think it was due to the results of drivers such as Hill, Dan Gurney, Ken Miles and others development skills which honed the GT 40 into such a BAD ARSE racecar! 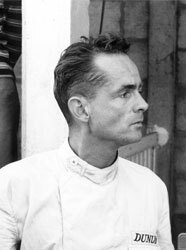 Recall that Hill was a gifted Sports Car driver of his era, ultimately winning le 24 Heurs du Mans three times for la Scuderia (Ferrari) in those ‘Uber-dominant 250 GT’s - all three wins coming with Belgian Co-driver Olivier Gendebien, (1958, 1961-62) becoming the first ever American born winner of LeMans in the process. Yet having grown tired of “Il Commendatore’s” (Enzo Ferrari) Machiavellian dealings with his drivers, Phil had the ‘Kuhoona’s to walk out on enzo, albeit to an outfit that’s Grand Prix exploits were a total disaster. As I still recall reading of Hill’s later exploits driving for Jim Hall and those narly Igloo-white Chaparral’s. With Phil’s last major victory coming aboard a Chaparral 2F at the 1000km of Brands Hatch; but I liken to remember Philip Toll Hill, Jr., in a different light, having previously mentioned that I met the man twice; first in 1992 at Portland International Raceway before spending a week-plus with Messer Hill in Italy in 1999 where amongst other things, he was my amiable Co-Tour guide at the Ferrari Factory!